What happened over the past 30 years? In a perfect world, health care spending should directly correlate to patient outcomes. Yet, this is not the case in the United States today, nor has it been for over 30 years. 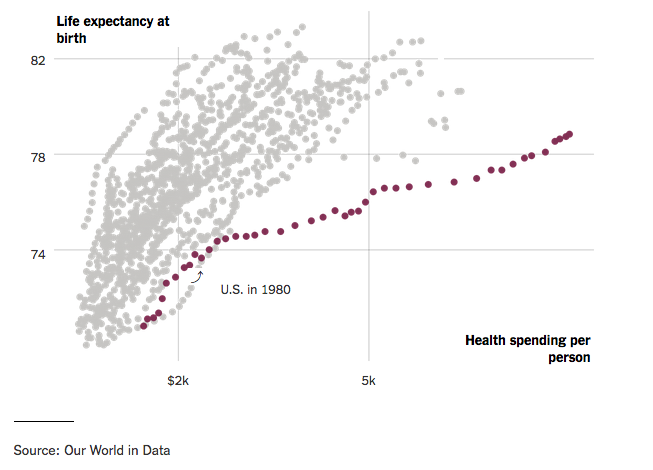 In a new piece published by Austin Frakt in the New York Times, the author traces America’s divergence since 1980 from other developed countries (e.g., Canada, the United Kingdom, Norway) in the amount of dollars spent on healthcare (far more than our comparable peers), and life expectancy (showing an alarming decline when compared to similar countries). What has led to the situation that the United States currently finds itself in? On the spending side, Frakt and his colleagues argue that much of the rising costs in America, when compared to its peers, comes from the fact that in other countries, there is far more government intervention in setting prices. In this article the author notes that, “Other countries have been able to put limits on health care prices and spending...the United States has relied more on market forces, which have been less effective.” This meant, and still means, that the United States struggles to place limits on the amount that can be spent on health care. Despite the belief that a market-based economy (as the American health care marketplace is) inspires lower prices through competition, Frakt notes that, “A recent study by economists at the University of Miami found that periods of rapid growth in U.S. health care spending coincide with rapid growth in markups of health care prices. This is what one would expect in markets with low levels of competition.” America also has higher administrative health care costs than other countries, further driving up prices. All of these factors combine to create a perfect storm of high spending on health care. All of this spending might be justified if Americans were seeing better health outcomes than their lower spending peers. Unfortunately, our higher spending since 1980 runs in parallel with a decline in life expectancy in the United States when compared to similar countries. While researchers are still debating why this has occurred, Frakt and his colleagues conjecture that, “lack of universal health coverage and less safety net support for low-income populations” could be to blame, as could social underfunding more broadly. True, Frakt’s article paints a less-optimistic picture on the state of health care in America (expensive with poor outcomes), but Avant-garde Health is working to right this ship by helping hospitals drive down costs while improving outcomes. We believe there are plentiful opportunities to use technology to reverse these alarming trends, starting with understanding the true cost of care delivery down to the case level. We know that for many hospitals, the tools do not exist to calculate and measure accurate costs. Fortunately, Avant-garde Health’s use of time-driven activity-based costing (TDABC) will allow your organization to truly understand your cost of delivering care over an entire cycle– along with its correlation to quality metrics. With this level of transparency, for example in trends over time and variation among the team, the analytics can identify where improvement is needed and the new trend of cost reduction can begin. 1 It is important to note that high health care spending in the United States has created an environment that encourages medical innovation (albeit expensive innovation) that many other similar countries do not experience. This innovation has unfortunately not directly led to better health outcomes in many instances.